Technology is always changing, and you may think that since you own a restaurant, you don’t need to make any changes to the technology that you use. It’s not like people come to your restaurant for your technology. They come for the food, right? Of course they do, but they also want to rely on you being able to offer them all the choices that come with modern restaurants today. They want to be able to make an online order that they can come in to pick up or have delivered to their home for the convenience of it. Here are some reasons why you should consider online ordering. You may already have ordering for your clients where they can call in for their pickup and delivery needs. It’s easy to think that’s good enough for your clients, but they may really enjoy the convenience of not having to pick up the phone to place an order. They can use their cell phone, tablet, or computer to place their order easily. At the end of a long day, there’s a good chance that your customer doesn’t want to have to deal with yet another phone call. They may be ready to just relax and decompress from a busy day at work that probably included quite a few phone calls. An online order makes it possible for them to place their order quickly being able to see all their food options, and then sit back with a glass of wine to relax while waiting. Most people like a nice variety, so they may not know exactly what they want that day. Maybe you change up your menu pretty often, and they don’t want to take a chance on ordering something that isn’t on the menu anymore or worry that they might miss something that sounds even better to them. There’s a good chance that your customer is going to be checking the Internet anyways to see what food sounds good enough to order, see what your specials are, or check out prices. Then, rather than just clicking on what they want and sending off an online order, they then have to pick up the phone and call them up. With online ordering, you can put up your menu, prices, and even pictures to help your customers with finding what they want on your menu. There can be nothing worse than an order being wrong. Your customer is going to be unhappy that their order is wrong and that they didn’t get what they were expecting to get. Your restaurant is going to have to deal with the aftermath in either preparing another meal or having to make up the mistake to the customer in some other fashion. Plus, there’s nothing that can ding your reputation more than a bad review for a wrong order. It can be very frustrating, but totally avoidable. Think about how hard it can be to take a phone order from your customers back in the kitchen. It can be so loud, that it can be hard to hear what the person is saying to you, and your customer may even hard time hearing what you’re saying to them. This is a prime situation for a miscommunication on either side that can end up in an inaccurate order. Improve your order accuracy with online ordering. Online ordering will allow your customers to pick out exactly what they want without having to go through a middleman. This ensures that your kitchen will get the order as the client intended it, and there isn’t a chance for a miscommunication with it. A final reason to consider for why you should get online ordering is how it can improve your workflow. Your phone won’t be ringing as often as more people will be placing online orders. That means someone won’t have to stop what he or she is doing to answer the phone, and try to take an accurate order over it. They can continue what they’re doing in preparing orders, seating customers or other necessary tasks rather than taking as many orders as in the past. This can change the whole dynamic of how your restaurant is run. You may be considering the reasons why you should implement online ordering into your restaurant’s strategy, and these offer some good supporting reasons. 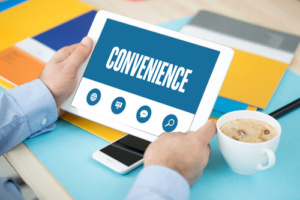 You may think that you’re better off sticking with what you know and not going outside of your comfort zone in additions to your menu, but adding online ordering can be a good thing for your business. Your current clients will love being able to order their favorite meal for pickup or delivery easily and you may even find that this attracts new clients to your restaurant. You can’t go wrong with implementing online ordering for your restaurant. Take advantage of technology to improve your business. Contact us today about how you can get started with online ordering for your restaurant.